All of the whimsical sculpture pieces are done by George as our attempt to recycle all pieces of the utensils that we cut. So the inspiration or suggestion to him was to do waiters/chefs who may have an interest to buy. At the shore shows we have done fisherman and in Center City Philadelphia we were doing a show in the Art Museum area and I suggested Rodin’s thinker since its such a recognizable classic figure in that area. Of course with George’s “classic” sense of humor he decided to put him sitting on two oval flattered spoons which gave the impression of a toilet. So he added a toilet seat back and called him “The Stinker.” So be it for “classic.”… But it sold immediately and then several were custom ordered for a plumbing business. Where do you find your silverware and what era of silverware is your favorite to find? We learned that the best plated utensils to use for jewelry were made pre-1960ish. It was an “IS” process called inlaid silver. Most of what I turn into jewelry comes from the early 1900s and late 1800s. 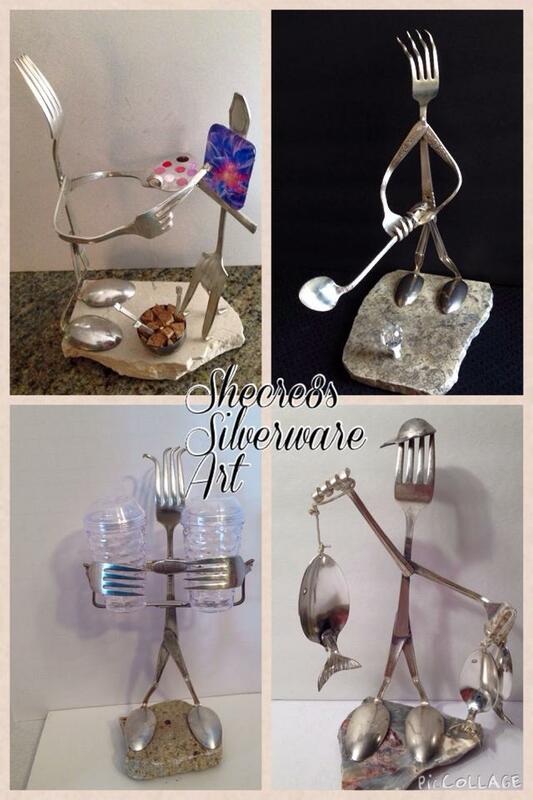 All other silverware we use as hooks, key chains, parts for sculptures etc. We are now lucky enough not to have to spend so much time scouring yard sales and flea markets. A man who collects scrap metal brings me what he collects. I buy online when I am targeting certain pieces or patterns. 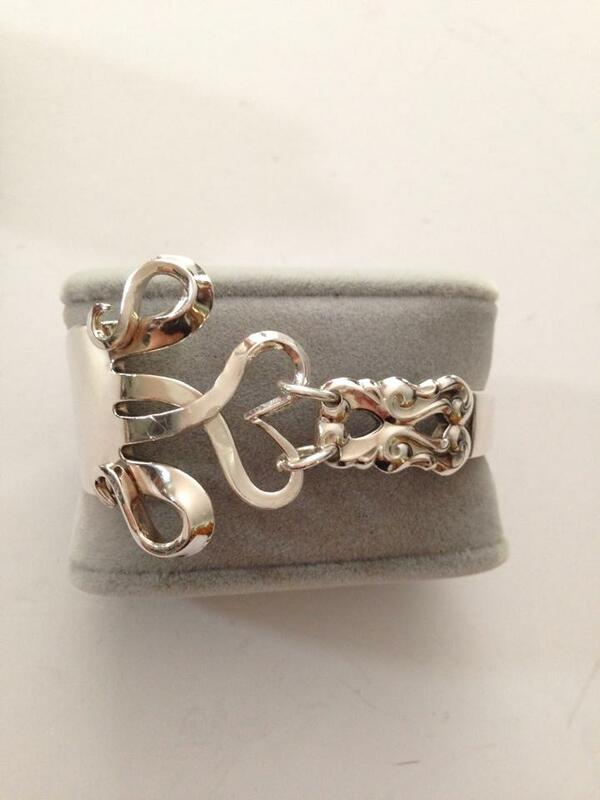 What is the process of bending and molding the shape of the jewelry? Why do you prefer not to heat the pieces for bending? We found that heating to bend the silverware changes the final result in finish when I go to buff the piece. Although it was OK, I prefer a shinier finish which would be what the piece would have looked like originally. So George does 95% of the fork tine bending since he has more hand strength. But I hand hammer all bracelets and rings around a mandrel on a vise. The pieces go through many steps of sanding, (4 grits of sanding discs) shaping the ends after holed, buffing out as much of the surface scratches as possible, thoroughly washing, tumbling and hand buffing before the piece gets dressed with links, magnets, gems etc. 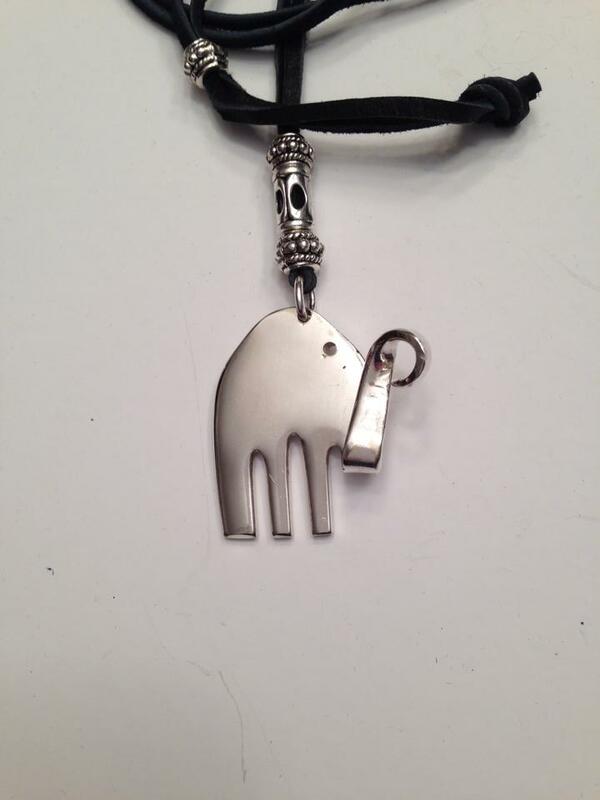 How long have you been making jewelry and why silverware inspired pieces? Once I was downsized (at my job) in 2012 I made beaded jewelry, stained glass, wire wrapping to stimulate the latent creativity that went untapped for so long as a way to decompress from years of corporate stress and a means to supplement my severance pay and bridge the gap between jobs. 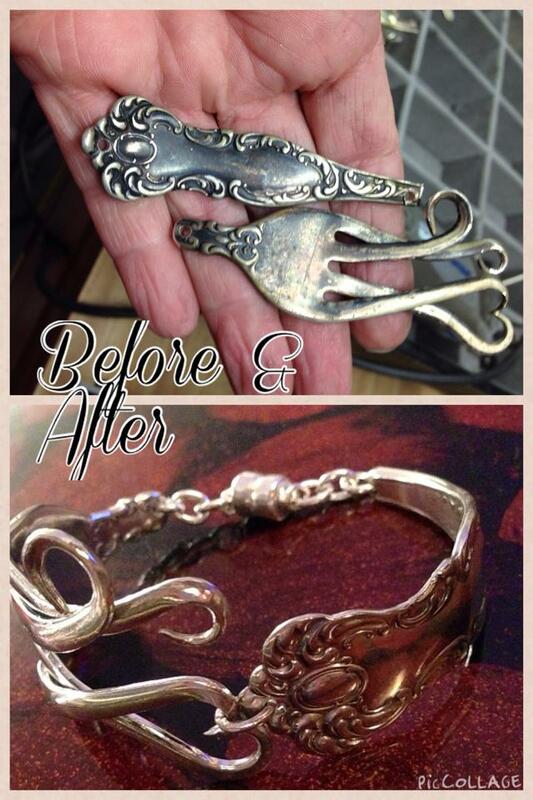 The silverware jewelry became a much more interesting creative challenge for me and the whole repurposing idea was extremely satisfying. I feel blessed that so many people enjoy our creations and since it has been very successful for us we intend to continue fulltime (even though George WAS semi-retired due to health issues). We both have found new life, energy and satisfaction in our joint effort to support ourselves through retirement. Favorite part about selling your pieces? Meeting the people face-to-face and come back to compliment us on how much they love it and appreciate the recycling of what would have been scrapped. If you could have one super-hero power what it be and why? Spider-Man. As I age my joints and muscles prevent me from getting certain places, like on a ladder, climbing stairs and Spider-Man can get everywhere fast and efficiently! Also not exactly a super power but “I dream of Jeannie”or “Bewitched” so I could just wiggle my nose and carry and move my product during show set up and breakdowns. They are brutal for us old folks.